Are you kinda set on the idea that pot roast should be made with beef? I was. And what a mistake that could have been. 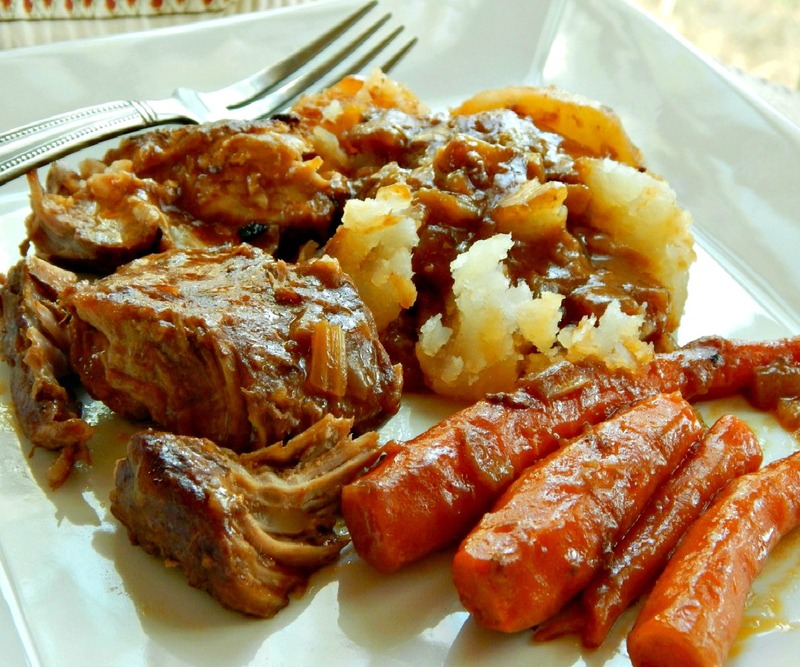 One of our new favorite winter meals is now Oven Braised Pork with Root Vegetables, a comfy, homey dish, full of potatoes and carrots and the most succulent pork you can imagine. Spoon tender, and that gravy? Talk about comfort. This is really one of our favorite meals. It’s so perfect on a winter weekend; you can get it going in the afternoon and then let it slowly braise away in the oven until that pork is so beautifully done and the potatoes all browned and roasted. I love those cold, winter days when the kitchen is all warmed up and the aroma good cooking just wafts through the house. Oven Braised Pork, on the platter ready for the table. This recipe makes enough for four to six people, but by all means, increase it if you want to have some leftovers. Long, slow braises like this generally no only take a lot of time but are even better the next day. That practically screams to me to maximize my time and make more & have two meals. When you brown the pork for this really take your time. The browned bits, the fond, on the bottom of the pan are going to be the basis for so much of the flavor in this simple pork pot roast dinner. There are herbs, of course, and wine, too and then that little surprise of just a touch of a dark jelly at the end. Don’t be tempted to leave it out; if you are unsure just add a wee bit, taste and then add more if you like it. You can probably easily bring this Oven Braised Pork with Root Vegetables for about a third of the cost of a beef chuck pot roast dinner. Really watch the specials on the pork; it drops to about 99 cents to $1.29 or so a pound about once a quarter. Sometimes you’ll find a real surprise, especially in the fall; I found it once for 49 cents a pound. You can bet a couple of those went in the freezer. I priced this recipe in April 2010 at $4.75 & remade April 2014 for $6.87. You can see this recipe uses just 2 1/2 pounds of pork shoulder; it’s a fairly modest amount per person after it’s roasted down. You may not even be able to buy a pork shoulder that small. Get a larger one, especially if the price is good and break it down into several pieces. Maximize your time, if you wish, by making another recipe with the rest. A pulled pork would be marvelous and different enough so you won’t feel you are eating the same thing. I always look for onions, carrots, and potatoes in larger bags. They’re usually cheaper per pound. Keep the potatoes and onions away from each other, potatoes in dark, well-ventilated area. Carrots go in the fridge, of course, watch so they don’t languish on the bottom of the veggie drawer. Turn them now and then so they don’t sit in condensation. In a large Dutch oven, heat olive oil over medium-high heat. Pat the pork dry and season well with salt and pepper, brown on all sides in pan, working in batches if necessary. Transfer pork to a plate. Add onion and celery to the pot. Sweat till softened, five to seven minutes. Add garlic and sweat another minute or two. Stir in the tomato paste, cook till lightly caramelized, about three minutes. Watch this carefully, you will need to stir it and work it. It’s a fine line between caramelized and burnt. Dust with flour, cook a short minute or two to cook off any raw flavor, stirring. Have your wine or liquid ready; it will cool things off quickly if it looks like there is danger of burning. Whisk in wine, scraping bottom of pan, simmer till reduced by half. Add the stock or broth. Return the pork to the pan with any juices, add bay leaves and thyme sprigs. Add water to bring the level of the liquid to just near the top of the pork, but do allow the liquid to cover the meat. Cover and place in oven to braise for two & half to three hours total at 325 degrees, until meat is fork tender. After an hour and 45 minutes in the oven, add in the potatoes and carrots. To promote browning of the vegetables, turn them in the sauce as you put them in. Check the liquid level and add a bit of additional water, if needed. It should be about halfway up the meat at this point. Check it for doneness and liquid level again at about 2 and 1/2 hours. Depending on how hot your oven runs, it may be close to being done. When tender, transfer meat, potatoes and large carrots to platter, reseason. Remove bay leaves and thyme stems, defat sauce and taste. If it seems a little flat, stir in the jam, it is a “stealth” ingredient and adds richness and rounds out the flavor; you won’t recognize it the dish. You may force the sauce with its diced vegetables through a sieve for a smoother consistency, or pass just as is, as I usually do. This entry was posted in Click here for Bargain Meals, Click here for Fabulous Food Posts and tagged Bargain Meal of the Week, Carrots, Easy Recipe, Frugal Hausfrau, Nutrition, Pork, Pork Shoulder Recipe, Potatoes, Wine. Bookmark the permalink.